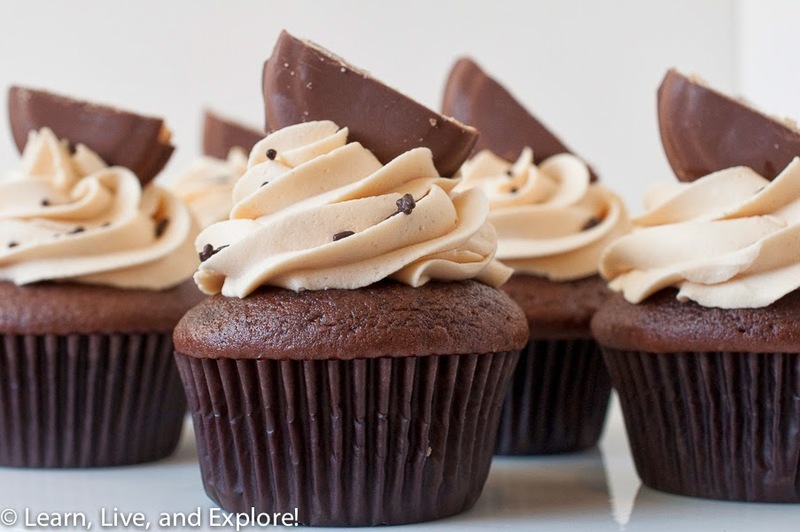 Tagalong Cupcakes ~ Learn, Live, and Explore! When I was a girl participating in the annual Girl Scout cookie sale to get my 100+ box patch, I knew these peanut butter and chocolate delights as Peanut Butter Patties. Also, I think the boxes cost $2.50. Well, now they are $4 and are referred to as Tagalongs. They are still delicious little fat bombs, and I still succumb to a box or two every cookie season. This year, I thought I would do something different and use them in a cupcake creation. I would love nothing more than to lie and say that the chocolate cake was made from scratch, but it wasn't. Though I had every intention of them being a from scratch treat, I was using a chocolate cupcake recipe from Martha Stewart and when I went to take them out of the oven at the 20 minute mark, I saw that they just imploded. It was definitely a leavening issue, I think. There just was no saving them. Fortunately, my neighbor was over and said she had a box of devil's food mix at her house. 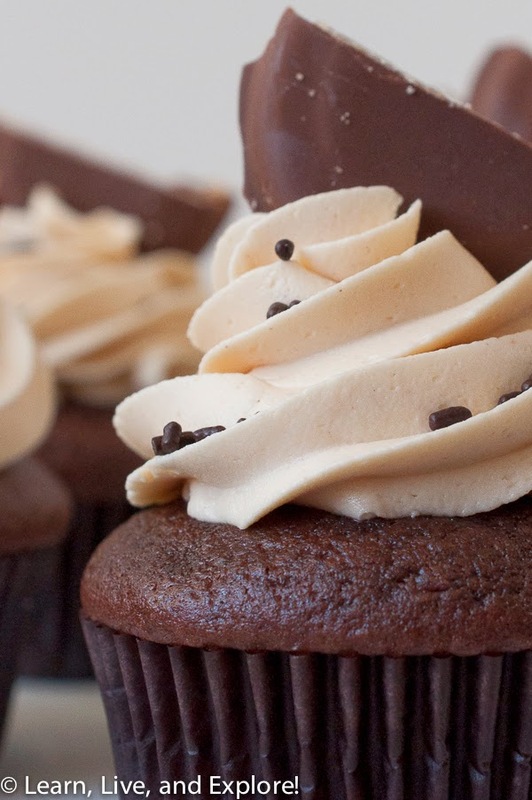 With a big bowl of peanut butter buttercream sitting on my counter, I begged her to go get it! Of course, she got some of the finished cupcakes in the end, so really she got her box of cake mix back. Anyway, there's my confession - these puffy chocolate domed cupcakes are from a box. I opted not to add the confectioner's sugar in the original recipe because there was going to be plenty of that in the buttercream. Just put the PB and marshmallow in a microwave safe bowl and heat it up about 60 seconds to mix them together well, then spoon the mixture into a piping bag before it gets too cool, snip off the end of the bag and squeeze into the hollowed out cupcake cores. I beat these all together, carefully, in a stand mixer. The buttercream was piped onto the cupcakes with a large star tip. To finish off the top, I placed half of a Tagalong cookie and some chocolate sprinkles.